Let me start off by saying RadioDJ has it all… and is FREE! RadioDJ is a FREE Radio Automation Software for your online radio station. It has the best User Interface of all the free radio automation software that I have seen and is better than other paid ones. The professional interface is simple, and does not have unnecessary options, menus or other things that you never use that tend to confuse you. RadioDJ is reliable, will run for months without a need of a reboot and will not crash every day and possibly not even crash at all. If the user has made a mistake in programming or somethings are not in the database it keeps going to the next element. There is other radio automation software that would crash at that condition especially the one that I know that is not free and is not cheap either. RadioDJ is very flexible, have the ability to do a particular action in multiple ways to accomplish a playout event or sequence. Comes with a built-in audio Processor plugin (with AGC, Compressor and 10 band Equalizer) for a great sound quality; including unlimited number of categories to build music rotations. RadioDJ uses audio frames to set up cues, Jingles, and sweepers; what this means is the software is very accurate. Also include a integrated Shoutcast/Icecast encoder (by plugin). These are only a few of the great features that RadioDJ comes with it. Another extra feature is the support forum is excellent. 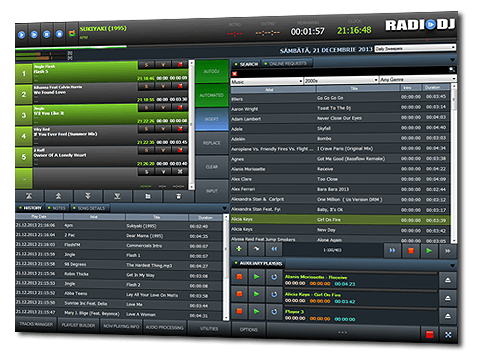 Some Reasons Why you should consider to use RadioDJ as your Radio Automation Software. It’s FREE NO restrictions, personal or commercial. Built in sound processing system. Simple to create or manage Playlist Rotations and Events. Fantastic Music library support. You can create and add categories as needed. There are more great reasons like the “Online request system” or the “Altacast plugin” for streaming to Shoutcast/Icecast but I will let you download RadioDJ and play with it and see for yourself. Say goodbye to spending money for automation software and invest that money in more listeners space for your shoutcast or icecast hosting.